Harry Potter and the Philosopher's (Sorcerer's in North America) Stone is an action-adventure video game with platform elements published by Electronic Arts. It is based on J.K Rowling's novel of the same name and the film adaptation. Philosopher's Stone was initially developed for the Game Boy Advance, Game Boy Color, Microsoft Windows and PlayStation in November 2001, and was re-made two years later for the GameCube, PlayStation 2 and Xbox in December 2003. The story follows protagonist Harry Potter, who discovers he is a wizard, and is sent to Hogwarts School of Witchcraft and Wizardry where he makes friends and receives magical training, and along with his friends stop Lord Voldemort from returning to power. The game received mixed reviews. Critics commented on the game's accessible gameplay and its unimpressive graphics (2003 versions) while others said the game's license would be the only thing to draw in fans. Harry Potter and the Philosopher's Stone gameplay is from a third-person perspective. The player controls the character Harry Potter from a third-person view. In the Microsoft Windows and Macintosh versions, the game is played like a third-person action and puzzle game. It features combat with various creatures and bosses such as Lord Voldemort. The Flipendo Jinx is used on both enemies and objects around the environment. Many other spells are learned during lessons taught by the teachers around the school. Like the Windows version, the game is a third-person action adventure game. However, the story is arranged in a completely different fashion to the PC version, and features different story events and gameplay. It was developed in the UK by Argonaut. The Game Boy Colour game is a role-playing game, similar to games like Final Fantasy. The player controls Harry, starting from when Hagrid brings him to Diagon Alley. It strictly follows the story of the books, with all the scenes from that point on in the book being playable, except for the addition of bands of monsters such as rats, bats, and spiders roaming most of the locations. The spells are used for combat, rather than interacting with the environment. The Game Boy Advance game is completely different from the Game Boy Color game. The Game Boy Advance game is a top down puzzle game. The player explores Hogwarts, and must attend classes which often include a challenge of collecting a certain number of items, such as challenge stars or potion ingredients. This game features the familiar monsters from the other games in the series, such as snails and gnomes. 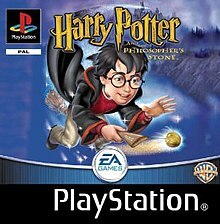 A new game of Harry Potter and the Philosopher's Stone was made for newer consoles in 2003 by Warthog Games, 2 years after the original versions. Its gameplay differed greatly from the other versions, followed the film far more closely than the other games, and was criticised for taking all the spells and world map from the Chamber of Secrets version of the game. Rubeus Hagrid, a mysterious giant, leaves an orphaned Harry Potter, whose parents were murdered by the evil Lord Voldemort, on the front door step of his bullying relatives, The Dursleys. For ten years, Harry has lived with the Dursleys, not knowing that he is a wizard, and famous in the wizarding world for being the only one to survive the attacks of Voldemort, whose name no one dares to say. Harry receives a letter inviting him to attend Hogwarts School of Witchcraft and Wizardry and is told who he really is. After buying his school supplies, at Diagon Alley, he boards the Hogwarts Express on platform 9¾ with the other students. Once they arrive at Hogwarts, the students are sorted into houses: Gryffindor, Hufflepuff, Ravenclaw and Slytherin. It is explained that if a student does a good thing or a bad thing, "points" will be added or deducted from their "House Points". This is important, as the House with the most points will win the House Cup at the end of the year. Harry is sorted into Gryffindor, after pleading with the Sorting Hat, a talking witch's hat, not to place him in Slytherin, notorious for being the house of darker witches and wizards, as well as Lord Voldemort. Once sorted, Harry meets Ron Weasley, a poor boy from a large, pure-blood, wizarding family and Hermione Granger, a witch born to Muggle parents. At school, Harry begins his training as a wizard and learns more about his past. After retrieving a remembrall while riding on a broomstick, for his classmate Neville Longbottom, Harry is appointed seeker of the Gryffindor Quidditch team. Tricked by Slytherin, Draco Malfoy, Harry, Ron and Hermione, accidentally come across a huge three-headed dog on a restricted floor of the castle. After escaping they realise the dog was standing on a trap door which is guarding the Philosopher's Stone, a magical object which grants the user immortality. When Harry is almost killed during a game of Quidditch, by what appeared to be Professor Snape uttering a curse at him, Harry concludes that he is after the Philosopher's Stone. Harry, Ron and Hermione set out to stop Snape from retrieving the Philosopher's Stone by putting the three-headed dog to sleep with music and going through the trapdoor. The three face a series of obstacles that protect the stone which includes surviving a deadly plant, catching a flying key, playing a life-sized game of Wizards Chess and choosing the correct potion to get through a magical fire. Harry, now alone, expects to face Snape but instead finds Professor Quirrell, the Defence Against the Dark Arts teacher. Quirrell removes his turban and reveals that Voldemort was living on the back of his head. Harry retrieves the stone and Voldemort tries to get it from him but touching him burns Quirrell's skin. Harry passes out from the struggle of the battle. He awakens in the school's hospital wing with Professor Dumbledore, the headmaster, by his side. Dumbledore explains that the stone has been destroyed but it wouldn't stop Voldemort from returning. He reassures Harry that if their battles did no more than slow Voldemort's return then he may never come back. During the end-of-year feast, Gryffindor wins the House Cup. Harry sees it as the best evening of his life and one that he will never forget. Harry Potter and the Philosopher's Stone is based on the story of the same name and through working with Warner Bros. the game also features the sets and environment from the film adaptation. The PC version was developed by software company KnowWonder and was built on the Unreal Engine which allowed for it to play on both software and hardware-accelerated modes. The game's executive producer Chris Graham stated that the game was aimed at eight- to fourteen-year-olds with its puzzle-based gameplay. The PlayStation version was developed by Argonaut as an action-platform game which integrated a 3D environment into its gameplay. The Game Boy Color and Game Boy Advance versions were individually developed by Griptonite Games and Eurocom. Philosopher's Stone was first revealed on the PC at the E3 expo in May 2001. A press release followed, months later, on 13 November 2001, days before the films 16 November release. The press release stated it would ship the game to coincide with the film adaptation of the same name. The Philosopher's Stone remake was initially rumoured in June 2003 for sixth-generation consoles. It was officially confirmed in July 2003 that EA was developing a new game for the GameCube, PlayStation 2 and Xbox console's based on a similar format as the Harry Potter and the Chamber of Secrets game released in 2002. The game was developed by Warthog Games and set out to fix some of the problems encountered in the previous game such as loading time. The game uses similar set designs and graphics as the Chamber of Secrets game and the previous generation consoles by making them 3D. The game was released on 12 December 2003. The voices featured in Philosopher's Stone have a likeness provided by the cast of the film adaptation. The voice cast features Joe Sowerbutts as Harry Potter, Draco Malfoy, Crabbe, and Goyle; Gregg Chillin as Ron Weasley and Lee Jordan; Emily Robinson as Hermione Granger; Allan Corduner as Snape, Filch, and Flitwick; David de Keyser as Albus Dumbledore, Quirinus Quirrell, and Lord Voldemort; and Gary Fairhall as the narrator. The cast differs in the next generation version with several of the younger cast members being replaced by the actors and Quirrell. So was Dale, too, with Stephen Fry having taken his place. who played them in later adaptations. For instance, Tom Attenborough replaces Joe Sowerbutts as Harry, whilst Harper Marshall takes on the role of Hermione. Jeremy Soule composed the music of Philosopher's Stone. The soundtrack was written by Soule before hearing the score by John Williams for the motion picture version, and features original themes written for the game. The soundtrack was released digitally in 2006. The PlayStation 2, Gamecube, and Xbox versions of Harry Potter and the Philosopher's Stone received mixed reviews from critics. The game was compared to the Chamber of Secrets game with IGN saying the game was "like the digital equivalent of a Ron Weasley hand-me-down." Worth Playing said the voice acting was "probably the game's best aural aspect", as the actors "deliver their lines in a believable and fitting style." IGN found the voice dialogue to be "well acted and very crisp." GamePro said the game was "more interactive and enjoyable" than the PlayStation version. Computer and Video Games commented on Hogwarts saying it is a "curiously flat experience, and not helped by the chronically jerky frame rate." X-Play said the games camera angles were "the worst offender ... It's a maddening and uncooperative system." Soundtrack Geek's Jon Blough identified Jeremy Soule's music for the soundtrack as too short. He also added that "the menacing and relaxing cues [in the music] fail[ed] to provide anything definitive." GameZone observed the tasks and quests and stated they ... aren't as compelling [as Chamber of Secrets], and the puzzles seem a little lacking." GameSpot praised the developers efforts, for the PlayStation version, in re-creating the Hogwarts castle and different looking characters, but said the game's graphics look like "extremely jagged polygons." It also praised the PlayStation version for its "bedtime-story-style narration" and the character voice overs, but criticised the games lack of music. PlayStation Illustrated noted that the PlayStation version has poor camera angles, adding that only the use of the 'L' and 'R' buttons can fix the problem, as it is not angled in the direction Harry is facing. The "fun to play" Quidditch matches were praised by PlayStation Illustrated, who stated that the "matches were excellently done" and controlling Harry was easy. Jeremy Conrad from IGN called it "one of the best-looking PS One games" for its graphics, but said that this can cause the frame rate to lag. The easy gameplay for the PC version was criticised by GameSpot, adding that the auto jump function removes any form of a challenge from the block puzzle and platform sequences. GameSpot described the score by Jeremy Soule as "enjoyable", but its repetitiveness and shortness made for less variety throughout the game. GameSpot praised Game Boy Advance version for its well-animated graphics and environment, paying close attention to small details such as Harry's cape flapping while he moves and his spellcasting gestures. Game Vortex criticised the GBA version for its lagging graphics that occurs when casting the "Flipendo" spell, the repetitive environments for each spell challenge level. It also criticised not being able to jump over bottomless pits in the spell challenge levels, where falling down results in the level being played from the beginning. GameZone praised the overall gameplay, controls and graphics, for the GBA, commenting that it is "a solid, enjoyable product", but pointed out draw-backs such as the simplistic puzzles. Game Vortex and GameZone both praised the Game Boy Color version's well detailed environments, gameplay and colour usage, but was faulted for its lack of detail on enemy characters who appeared indiscernible to the main characters. IGN commented that those who had not read the books "may be left in the dark", as there is very little narrative in the game, and tends to be aimed at Harry Potter fans. In Japan, Famitsu gave the GameCube and PlayStation 2 versions a score of all four sixes for a total of 24 out of 40. Philosopher's Stone received positive sale figures, despite mixed reviews. From November 2001, to February 2002 it was listed as one of the top three highest-selling PC video games, and was the top selling PC title in December 2001. In February 2002, the NPD Group listed it as the third top-selling PC game of 2001 after being available for only two months in North America. North American sales of its computer version reached 867,481 units by the end of 2001, which drew revenues of $24.6 million. The PlayStation version sold eight million copies, making it one of the best-selling PlayStation games and one of the best-selling video games of all time at the time of the release. The PlayStation version of The Philosopher's Stone received a "Platinum" sales award from the Entertainment and Leisure Software Publishers Association (ELSPA), indicating sales of at least 300,000 copies in the United Kingdom. ELSPA gave the game's computer version a "Gold" certification, for sales of at least 200,000 copies in the region. In the United States alone, The Philosopher's Stone's computer version sold 1.3 million copies and earned $33.9 million by August 2006, after its release in November 2001. It was the country's fourth best-selling computer game between January 2000 and August 2006. Combined sales of all Harry Potter computer games released between January 2000 and August 2006, including The Philosopher's Stone, had reached 2.7 million units in the United States by the latter date. In the United States, The Philosopher's Stone's Game Boy Advance version sold 690,000 copies and earned $26 million by August 2006. During the period between January 2000 and August 2006, it was the 36th highest-selling game launched for the Game Boy Advance, Nintendo DS or PlayStation Portable in that country. Both versions of the game received multiple nominations. The original version received three nominations from the Academy of Interactive Arts & Sciences for "Best Console Family Game", "Best Original Music Composition", and "Best PC Family Game" at the 5th Interactive Achievement Awards. It was also nominated for a Nickelodeon Kids' Choice Award in the "Favourite Video Game" category at the 2002 Nickelodeon Kids' Choice Awards. The remake received a nomination for a Golden Joystick Award in 2003 for "MTV Film Adaptation of the Year" but lost to The Lord of the Rings: The Two Towers. The soundtrack received a nomination from the Academy of Interactive Arts & Sciences for Original Musical Composition in 2002 but lost to Tropico. ^ "Games developed by Griptonite Games". IGN. Archived from the original on 31 May 2011. Retrieved 10 May 2011. ^ "Games developed by Eurocom". IGN. Archived from the original on 30 April 2011. Retrieved 10 May 2011. ^ "Games developed by KnowWonder Digital Mediaworks". IGN. Archived from the original on 26 July 2011. Retrieved 10 May 2011. ^ "Games developed by Argonaut Games". IGN. Archived from the original on 26 July 2011. Retrieved 10 May 2011. ^ "Games developed by Westlake". IGN. Archived from the original on 26 July 2011. Retrieved 10 May 2011. ^ "Games developed by Warthog". IGN. Archived from the original on 26 July 2011. Retrieved 10 May 2011. ^ "EA's Harry Potter and the Sorcerer's Stone Now Available for Next-Gen Consoles". Game Info Wire. 14 December 2003. Archived from the original on 26 July 2011. Retrieved 10 May 2011. ^ "Harry Potter and the Philosopher's Stone Releases". Giant Bomb. Archived from the original on 29 August 2011. Retrieved 10 May 2011. ^ "Harry Potter and the Philosopher's Stone release dates". GameSpot. Archived from the original on 23 January 2013. Retrieved 10 May 2011. ^ a b c d e f Casamassina, Matt (9 December 2003). "Harry Potter and the Sorcerer's Stone Review". IGN. Archived from the original on 23 February 2014. Retrieved 26 January 2014. ^ a b c d e f Steinberg, Steve (30 December 2003). "Harry Potter and the Sorcerer's Stone". GameSpy. Archived from the original on 7 January 2006. Retrieved 26 January 2014. ^ a b Butts, Steve (16 November 2001). "Harry Potter and the Sorcerer's Stone (PC)". IGN. Archived from the original on 23 February 2014. Retrieved 26 January 2014. ^ a b c Sulic, Ivan (9 August 2001). "Harry Potter and the Sorcerer's Stone". IGN. IGN Entertainment, Inc. Archived from the original on 27 February 2012. Retrieved 8 June 2010. ^ a b c Press release (13 November 2001). "CALLING ALL WIZARDS-IN-TRAINING EA LAUNCHES FOUR HARRY POTTER VIDEO GAMES". MobyGames. Archived from the original on 9 July 2011. Retrieved 8 June 2010. ^ IGN Staff (19 May 2001). "E3: Harry Potter Hands-on". IGN. IGN Entertainment, Inc. Archived from the original on 13 July 2011. Retrieved 8 June 2010. ^ "E3: Harry Potter and the Sorcerer's Stone". GamePro. Archived from the original on 7 June 2011. Retrieved 8 June 2010. ^ "Griptonite Games". IGN. IGN Entertainment, Inc. Archived from the original on 31 December 2009. Retrieved 8 June 2010. ^ IGN Staff (17 May 2001). "E3 2001: Harry Potter – The PC Experience". IGN. IGN Entertainment, Inc. Archived from the original on 12 August 2011. Retrieved 8 June 2010. ^ Ahmed, Shahed (13 November 2001). "Harry Potter games ship". GameSpot. CBS Interactive Inc. Archived from the original on 2 July 2012. Retrieved 8 June 2010. ^ "Rumor: EA to produce new Philosopher's Stone game?". The Leaky Couldron. HPANA. 26 June 2003. Archived from the original on 7 March 2005. Retrieved 8 June 2010. ^ a b c Casamassina, Matt (14 July 2003). "Harry Potter and the Sorcerer's Stone". IGN. IGN Entertainment, Inc. Archived from the original on 13 July 2011. Retrieved 8 June 2010. ^ "EA makes Sorcerer's Stone 3D". HPANA. 7 July 2003. Archived from the original on 17 December 2007. Retrieved 8 June 2010. ^ Press release (7 July 2003). "EA'S HARRY POTTER AND THE SORCERER'S STONE NOW AVAILABLE FOR NEXT-GEN CONSOLES". GameZone. GameZone Online. Retrieved 8 June 2010. ^ Newton, Victoria (1 November 2001). "Harry Potter and the Broken Voice". The Sun. Archived from the original on 23 October 2012. Retrieved 23 December 2006. ^ "Jeremy Soule doet de muziek in Neverwinter Nights" (in Dutch). Gamer NL. 16 March 2002. Archived from the original on 26 April 2012. Retrieved 28 November 2011. ^ "Harry Potter & The Sorcerer's Stone: Original Video Game Soundtrack". Yahoo! Music. Archived from the original on 3 February 2013. Retrieved 28 November 2011. ^ Miller, Skyler. "Harry Potter and the Sorcerer's Stone (GBA) - Review". AllGame. Archived from the original on 13 November 2014. Retrieved 19 June 2015. ^ Marriott, Scott Alan. "Harry Potter and the Sorcerer's Stone (GBC) - Review". AllGame. Archived from the original on 13 November 2014. Retrieved 19 June 2015. ^ Williams, Hilary. "Harry Potter and the Sorcerer's Stone (PC) - Review". AllGame. Archived from the original on 13 November 2014. Retrieved 19 June 2015. ^ EGM staff (February 2002). "Harry Potter and the Sorcerer's Stone (GBA)". Electronic Gaming Monthly (151): 172. ^ EGM staff (2002). "Harry Potter and the Sorcerer's Stone (GBC)". Electronic Gaming Monthly. ^ EGM staff (February 2002). "Harry Potter and the Sorcerer's Stone (PS)". Electronic Gaming Monthly (151): 170. ^ a b c "Famitsu scores for PGR2, Magatama". The MagicBox. 6 November 2003. Archived from the original on 9 June 2016. Retrieved 29 April 2016. ^ Helgeson, Matt (January 2002). "Harry Potter and the Sorcerer's Stone (PS)". Game Informer (105): 88. Archived from the original on 15 September 2008. Retrieved 26 January 2014. ^ Mason, Lisa (January 2004). "Harry Potter and the Sorcerer's Stone (PS2)". Game Informer (129): 134. Archived from the original on 22 January 2008. Retrieved 26 January 2014. ^ Dan Elektro (20 November 2001). "Harry Potter and the Sorcerer's Stone Review for Game Boy Advance on GamePro.com". GamePro. Archived from the original on 18 January 2005. Retrieved 26 January 2014. ^ Sky Champion Silver (19 November 2001). "Harry Potter and the Sorcerer's Stone Review for Game Boy Color on GamePro.com". GamePro. Archived from the original on 22 December 2004. Retrieved 26 January 2014. ^ Air Hendrix (16 November 2001). "Harry Potter and the Sorcerer's Stone Review for PlayStation on GamePro.com". GamePro. Archived from the original on 4 February 2005. Retrieved 26 January 2014. ^ a b Dan Elektro (9 December 2003). "Harry Potter and the Sorcerer's Stone". GamePro. Archived from the original on 7 June 2011. Retrieved 7 June 2010. ^ a b c Dodson, Joe (16 January 2004). "Harry Potter and the Sorcerer's Stone Review". Game Revolution. Archived from the original on 19 June 2015. Retrieved 26 January 2014. ^ a b Villoria, Gerald (13 December 2001). "Harry Potter and the Sorcerer's Stone Review (GBA)". GameSpot. Archived from the original on 29 March 2014. Retrieved 26 January 2014. ^ a b c Torres, Ricardo (22 December 2003). "Harry Potter and the Sorcerer's Stone Review (GC, PS2, Xbox)". GameSpot. Archived from the original on 20 March 2014. Retrieved 26 January 2014. ^ a b c Villoria, Gerald (5 December 2001). "Harry Potter and the Sorcerer's Stone Review (PC)". GameSpot. Archived from the original on 10 January 2007. Retrieved 26 January 2014. ^ a b c Villoria, Gerald (13 December 2001). "Harry Potter and the Sorcerer's Stone Review (PS)". GameSpot. Archived from the original on 29 March 2014. Retrieved 26 January 2014. ^ Burns, Enid "Grid" (12 February 2002). "Harry Potter and the Sorcerer's Stone (PC)". GameSpy. Archived from the original on 23 February 2005. Retrieved 26 January 2014. ^ a b Lafferty, Michael (26 December 2001). "Harry Potter and the Sorcerer's Stone – GBA – Review". GameZone. Archived from the original on 1 March 2005. Retrieved 26 January 2014. ^ a b Code Cowboy (8 May 2002). "Harry Potter and the Sorcerer's Stone – GBC – Review". GameZone. Archived from the original on 10 October 2008. Retrieved 26 January 2014. ^ a b Hollingshead, Anise (2 January 2004). "Harry Potter Sorcerer's Stone [sic] – GC – Review". GameZone. Archived from the original on 15 October 2008. Retrieved 26 January 2014. ^ Giacobbi, Kevin "BIFF" (4 January 2002). "Harry Potter and the Sorcerer's Stone Review - PC". GameZone. Archived from the original on 11 December 2008. Retrieved 26 January 2014. ^ Bedigian, Louis (26 December 2003). "Harry Potter and the Sorcerer's Stone Review - PlayStation 2". GameZone. Archived from the original on 28 October 2008. Retrieved 26 January 2014. ^ The Bearer (21 December 2003). "Harry Potter and the Sorcerer's Stone Review - Xbox". GameZone. Archived from the original on 25 May 2009. Retrieved 26 January 2014. ^ Harris, Craig (20 November 2001). "Harry Potter and the Sorcerer's Stone Review (Game Boy Advance)". IGN. Archived from the original on 23 February 2014. Retrieved 26 January 2014. ^ a b Goldstein, Hilary (20 November 2001). "Harry Potter and the Sorcerer's Stone Review (Game Boy Color)". IGN. Archived from the original on 23 February 2014. Retrieved 26 January 2014. ^ a b Conrad, Jeremy (9 November 2001). "Harry Potter and the Sorcerer's Stone (PlayStation)". IGN. Archived from the original on 23 February 2014. Retrieved 26 January 2014. ^ "Harry Potter and the Sorcerer's Stone (GBA)". Nintendo Power. 151: 170. December 2001. ^ "Harry Potter and the Sorcerer's Stone (GBC)". Nintendo Power. 152. January 2002. ^ "Harry Potter and the Sorcerer's Stone (GC)". Nintendo Power. 176: 149. February 2004. ^ "Harry Potter and the Sorcerer's Stone (PS)". Official U.S. PlayStation Magazine: 118. February 2002. ^ "Harry Potter and the Sorcerer's Stone (PS2)". Official U.S. PlayStation Magazine: 118. January 2004. ^ "Harry Potter and the Sorcerer's Stone". Official Xbox Magazine: 79. January 2004. ^ Kuo, Li C. (February 2002). "Harry Potter and the Sorcerer's Stone". PC Gamer: 68. Archived from the original on 27 December 2004. Retrieved 26 January 2014. ^ "Harry Potter and the Sorcerer's Stone Critic Reviews for Game Boy Advance". Metacritic. Archived from the original on 25 April 2014. Retrieved 25 January 2014. ^ "Harry Potter and the Sorcerer's Stone Critic Reviews for GameCube". Metacritic. Archived from the original on 25 April 2014. Retrieved 25 January 2014. ^ "Harry Potter and the Sorcerer's Stone Critic Reviews for PC". Metacritic. Archived from the original on 25 April 2014. Retrieved 25 January 2014. ^ "Harry Potter and the Sorcerer's Stone Critic Reviews for PlayStation". Metacritic. Archived from the original on 25 April 2014. Retrieved 25 January 2014. ^ "Harry Potter and the Sorcerer's Stone Critic Reviews for PlayStation 2". Metacritic. Archived from the original on 25 April 2014. Retrieved 25 January 2014. ^ "Harry Potter and the Sorcerer's Stone Critic Reviews for Xbox". Metacritic. Archived from the original on 25 April 2014. Retrieved 25 January 2014. ^ The Cookie Snatcher (2 March 2004). "PS2 Review – 'Harry Potter and the Sorcerer's Stone'". Worthplaying. Archived from the original on 9 October 2010. Retrieved 7 June 2010. ^ CVG Staff (6 January 2004). "PS2 Review: Harry Potter and the Philosopher's Stone". Computer and Video Games. Archived from the original on 24 June 2007. Retrieved 26 January 2014. ^ Schkloven, Emmett (19 January 2004). "'Harry Potter and the Sorcerer's Stone' (PS2) Review". X-Play. Archived from the original on 18 February 2004. Retrieved 26 January 2014. ^ Blough, John (20 July 2009). "Soundtrack Review: Harry Potter and the Sorcerer's Stone Video Game (2001)". Soundtrack Geek. Archived from the original on 21 July 2009. Retrieved 26 January 2014. ^ a b Paddock, Matt. "Harry Potter and the Sorcerer's Stone (Playstation review)". Playstation Illustrated. (Game Vortex). p. 1. Archived from the original on 15 July 2011. Retrieved 16 February 2011. ^ a b Tuckerl, Ricky. "Harry Potter and the Sorcerer's Stone (GBA review)". Game Vortex. (Game Vortex). p. 1. Archived from the original on 17 April 2011. Retrieved 16 February 2011. ^ Bordelon, Phil. "Harry Potter and the Sorcerer's Stone (GBC review)". Game Vortex. (Game Vortex). Archived from the original on 17 April 2011. Retrieved 16 February 2011. ^ NPD Staff (7 February 2002). "NPD Reports Annual 2001 U.S. Interactive Entertainment Sales Shatter Industry Record". NPD Group. Archived from the original on 25 June 2012. Retrieved 7 June 2011. ^ Edge Staff (25 August 2006). "The top 100 PC games of the 21st Century (Page 10)". Edge. Archived from the original on 16 June 2012. Retrieved 29 April 2016. ^ Bradshaw, Lucy (31 January 2002). "Markle Forum on Children and Media" (PDF). New York University. Archived (PDF) from the original on 19 June 2004. ^ "ELSPA Sales Awards: Platinum". Entertainment and Leisure Software Publishers Association. Archived from the original on 15 May 2009. ^ a b Caoili, Eric (26 November 2008). "ELSPA: Wii Fit, Mario Kart Reach Diamond Status In UK". Gamasutra. Archived from the original on 18 September 2017. ^ "ELSPA Sales Awards: Gold". Entertainment and Leisure Software Publishers Association. Archived from the original on 19 March 2009. ^ Edge Staff (25 August 2006). "The Top 100 PC Games of the 21st Century". Edge. Archived from the original on 17 October 2012. ^ Keiser, Joe (2 August 2006). "The Century's Top 50 Handheld Games". Next Generation. Archived from the original on 10 October 2007. ^ AIAS Staff. "Harry Potter and the Sorcerer's Stone nomination details". Academy of Interactive Arts & Sciences. Archived from the original on 19 March 2012. Retrieved 7 June 2011. This page was last edited on 5 March 2019, at 12:56 (UTC).